Online spending on Thanksgiving day reached $3.7 billion, topped by Black Friday sales of $6.2 billion, and Cyber Monday sales of $7.9 billion—it’s a staggering amount of spending, but what there’s another data set casting a cloud over the enthusiasm: Growing numbers of Americans plan to boycott holiday spending, entirely. While shopping madness has many Americans feverishly trying to find the best gifts for everyone on their list, others are protesting the commercialization of Christmas. 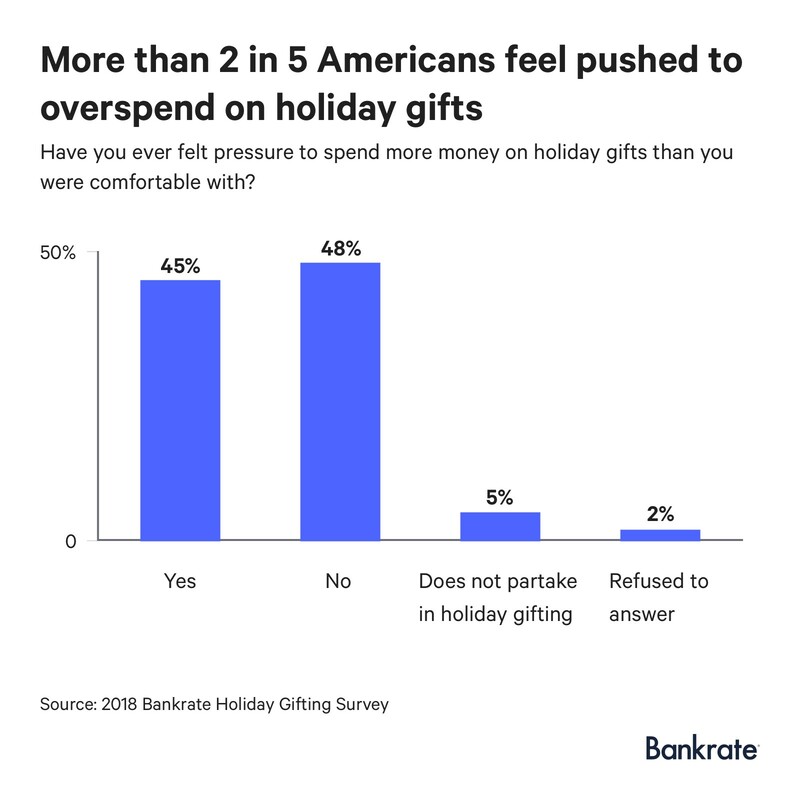 In fact, the 2018 Bankrate Holiday Gifting Survey showing that 13 percent of American shoppers are planning to completely boycott holiday spending. That means they’ll be resisting all the sales gimmicks designed to pressure consumers into spending—and overspending, in the end. And if they’re going to drop all that cash on Christmas, some say they’d rather take a family vacation. It’s a small percentage—for now. But it’s a piece of data that still should make retailers nervous. Despite growing consumer resistance, 45 percent of shoppers will still spend beyond their comfort zone, says Bankrate's survey. And in this race to show their love by gifts—where larger gifts apparently mean more love--Americans are prepared to plunge themselves into heavy debt. 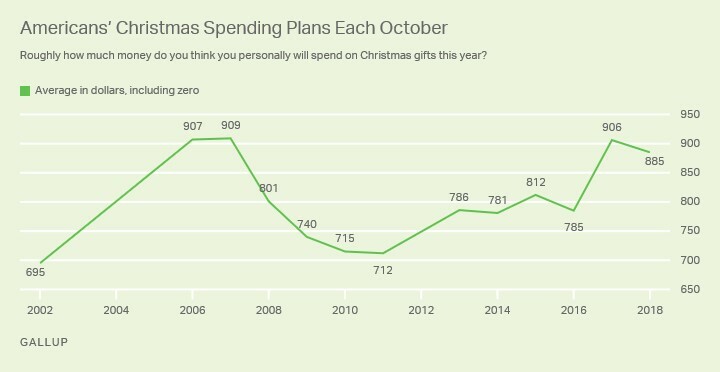 According to Gallup's poll, Americans will spend an estimated $885, on average, on gifts this year, which is a bit lower than the 906 recorded in October 2017, but still higher than any other October holiday spending projection by Gallup since the recession. The same poll shows that 33 percent of Americans plan to spend at least $1,000 on Christmas gifts, while 22 percent will spend between $500 and $999, 29 percent will spend less than $500 and just 3 percent will spend less than $100. Only 8 percent are not planning to spend money on Christmas gifts, because they don’t celebrate the holiday. According to data from market research firm eMarketer, Christmas holiday retail sales in the U.S. are expected to reach above $1 trillion—it’s strongest growth since 2011. In-store sales are forecast to rise 4.4 percent year-on-year, while e-commerce sales are predicted to grow by 16.6 percent, led by Amazon and eBay. Half of all shoppers plan to spend the bulk of their holiday budget online. More than one-third of millennials and one out of four parents now spend more than six hours on their mobile devices, more than 500% more time than they spend watching television, according to the 2018 Consumer Holiday Shopping Report by The Harris Poll and OpenX. The consumers, then, are still far out-ranking the holiday protesters, but as pressure mounts on the money=love equation, something might give sooner rather than later. Or, perhaps travel agencies will find a new niche selling holiday vacation packages that end up replacing the traditional ribbons and wrapping under the tree.